Temporary address during construction at 241 Plashet Road. Capacity 200 is a guess. Al-Hira Masjid (Mosque) and Educational Centre in East London, is a spiritual and educational facility which not only serves as a place of worship, for the Muslims of East London but also strives to lead as an Islamic educational institute. Estabished in 1996, under the patronage of Sheikh Sultan Fiaz-ul-Hassan Qadri Sarwari and Sheikh Sutan Niaz-ul-Hassan Qadri Sarwari, the intial purpose of the Masjid (mosque) was to provide the Muslims of the local vicinity (East London) a place of worship, where they could pray five times a day. Imam Zahoor Ahmed Sa’fi was appointed the first Imam of the mosque and Mr Altaf Hussain (Late) was successfully elected the first president of Masjid committee. Al Hira Educational Centre is part of a larger orgnaisation called Hazrat Sultan Bahu Trust. Al Hira Educational Centre was founded in 1996 by volunteers who are Mureeds of Peer Fiaz Ul Hassan Qadri Sahib, the founder of Hazrat Sultan Bahu Trust. We host a wide range of volunteered based services and projects, many in partnership with other major organisations. The mosque facilitates for the obligatory 5 times prayer, Jummah and also Eid. Mufti Yaar Muhammad Sahib, from Hazrat Sultan Bahu Markaz Birmingham, who is also very well known for his Q&A sessions on Noor TV, spends his Friday evenings in our Markaz to answer questions with everyone one on one! To lighten everyone’s souls with the remembrance of Allah once a month, we also monthly Gyarwi Sharif mehfils. Most importantly for the youth we have annual summer camp, with students enjoying their summer holidays in the remembrance of Allah. With a sister Mariam, who came down specially from Noor TV to spend her summer holidays teaching. With students saying "We really enjoyed this summer camp, we have learnt many new things and it was definately worth getting out of bed in the morning for!" We also have advance Nazra classes running for both girls and boys, for students aged 4-17. The temporary site is located a 7 minutes walk from the construction site. 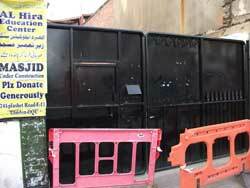 The temporary site is on the corner of Upton Park Road, which is a road leading of the main road, Green Street. The closest London underground station is Upton Park Station which is a approx 20 minute walk. Upton Park Station is served by the Disrtict and Hammersmith and City lines. Several buses travel nearby the Mosque. Buses 58, 330 stop on Green Street, the closest stop is called "Oakdale Road". Which is a 2 minute walk. Their are two buses served from Stratford Station, buses 238 and 104, they both stop on Plashet Road, the closest stop is called "Lucas Avenue"